One of the charges of contradiction brought by skeptics against the Bible is the surface appearance of contradiction between Matthew’s genealogical list (1:1-17) and the one provided by Luke (3:23-38). As is always the case, the charge of contradiction is premature and reflects an immature appraisal of the extant evidence. In every case of alleged contradiction, further investigation has yielded additional evidence that exonerates the Bible and further verifies its inerrancy. The alleged discrepancies pertaining to Matthew and Luke’s genealogies were explained and answered long ago (e.g., Haley, 1977, pp. 325-326; McGarvey, 1910, pp. 344-346; McGarvey, 1974, pp. 51-55; cf. Lyons, 2003). When one places the two genealogical lists side by side, several factors become immediately apparent that combine to dispel the appearance of conflict. First, Matthew reported the lineage of Christ only back to Abraham; Luke traced it all the way back to Adam. Second, Matthew used the expression “begat;” Luke used the expression “son of,” which results in his list being a complete reversal of Matthew’s. 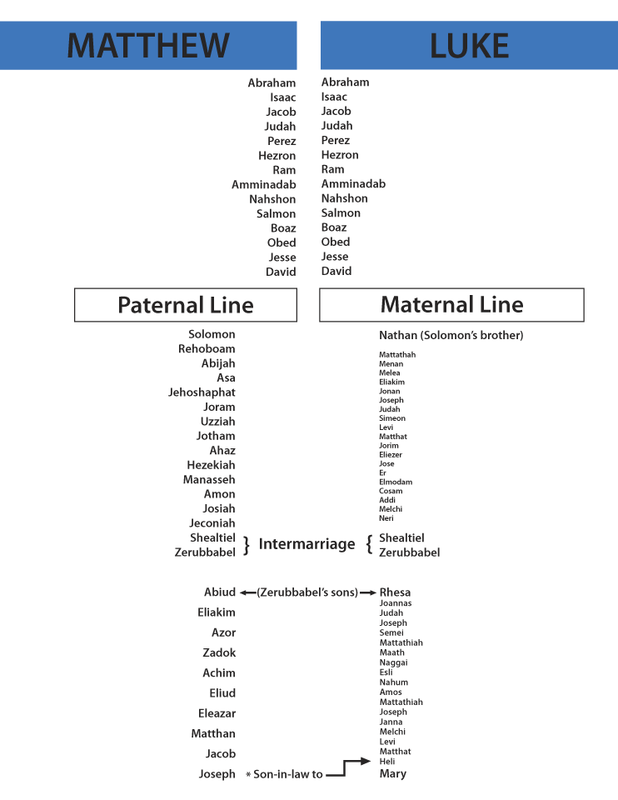 Third, the two genealogical lines parallel each other from Abraham to David. Fourth, beginning with David, Matthew traced the paternal line of descent through Solomon; Luke traced the maternal line through Solomon’s brother, Nathan. 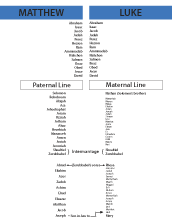 A fifth factor that must be recognized is that the two lines (paternal and maternal) link together in the intermarriage of Shealtiel and Zerubbabel. But the linkage separates again in the two sons of Zerubbabel—Rhesa and Abiud. Sixth, the two lines come together once again for a final time in the marriage of Joseph and Mary. Joseph was the end of the paternal line, while Mary was the last of the maternal line as the daughter of Heli. The reason Joseph is said to be the “son” of Heli (Mary’s father) brings forth a seventh consideration: the Jewish use of “son.” Hebrews used the word in at least five distinct senses: (1) in the sense used today of a one-generation offspring; (2) in the sense of a descendant, whether a grandson or a more remote descendant many generations previous, e.g., Matthew 1:1; 21:9; 22:42 (“begat” had this same flexibility in application); (3) as a son-in-law (the Jews had no word to express this concept and so just used “son”—e.g., 1 Samuel 24:16; 26:17); (4) in accordance with the Levirate marriage law (Deuteronomy 25:5-10; cf. Matthew 22:24-26), a deceased man would have a son through a surrogate father who legally married the deceased man’s widow (e.g., Ruth 2:20; 3:9,12; 4:3-5); and (5) in the sense of a step-son who took on the legal status of his step-father—the relationship sustained by Jesus to Joseph (Matthew 13:55; Mark 6:3; Luke 3:23; 4:22; John 6:42). Notice carefully that Joseph was a direct-line, blood descendant of David and, therefore, of David’s throne. Here is the precise purpose of Matthew’s genealogy: it demonstrated Jesus’ legal right to inherit the throne of David—a necessary prerequisite to authenticating His Messianic claim. However, an equally critical credential was His blood/physical descent from David—a point that could not be established through Joseph since “after His mother Mary was betrothed to Joseph, before they came together, she was found with child of the Holy Spirit” (Matthew 1:18, emp. added). This feature of Christ’s Messiahship was established through His mother Mary, who was also a blood descendant of David (Luke 1:30-32). Both the blood of David and the throne of David were necessary variables to qualify and authenticate Jesus as the Messiah. Once again, the Bible’s intricate complexities shine forth to dispel the critic’s accusations, while simultaneously demonstrating its own infallible representations. The more one delves into its intricacies and plummets its intriguing depths, the more one is driven to the inescapable conclusion that the Bible is, indeed, the Book of books—the inspired Word of God. Haley, John W. (1977), Alleged Discrepancies of the Bible (Grand Rapids, MI: Baker). Lyons, Eric (2003), The Anvil Rings (Montgomery, AL: Apologetics Press).